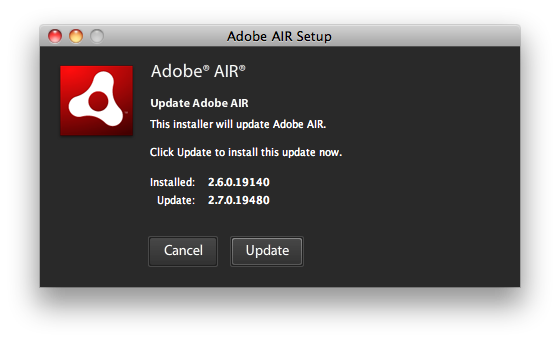 Adobe AIR 2.7 now available across ALL supported platforms !! New features: Adobe AIR 2.7 offers a similar set of new features available in Flash Player 10.3 as well as some new mobile features, and incorporates support for video enhancements as well as performance improvements, particularly for iOS apps. AIR apps for iOS render up to 4x faster in CPU mode. Developers can now debug and build iOS applications faster than with previous versions using a new mode available within the AIR Developer Tool (ADT). This feature allows end users to install or move the AIR runtime onto the SD cards within their Android devices so they can free up storage space on the phone. AIR now includes the same built-in support for media measurement as Adobe Flash® Player 10.3, allowing companies to simplify the collection of real-time, aggregated reporting data for how content is distributed and viewed by users. With direct support for Adobe SiteCatalyst®, developers can implement video analytics for existing or legacy video players with as little as two lines of code. With integrated support for acoustic echo cancellation, developers can now add real-time VoIP capabilities to games, enterprise, and other types of applications without requiring users to wear a noise-canceling headset. Enables seamless weblink-style navigation within desktop apps such as magazine viewers and ebook readers.